You can visit Toronto any time of the year and find entertainment and activities to do. However, summer is one of the best seasons to visit Canada’s largest city, and here a few reasons why. This is a bit of a no brainer for Toronto and of course had to be the top reason why the summer months are a great time to visit the city. Whether you like it or not Toronto is buried with snow and battered with cold weather for a good portion of the year. So when the summer sun shines, the city comes alive! It can get very warm in the city and can be a great time to explore. In Canada there is nothing like enjoying a cool drink or nice meal outside after being cooped up for months inside. Toronto’s downtown core is littered with hundreds of patios with enough variety for every visitor. Whether it’s a waterfront patio or one tucked between two houses on the west end siting out and enjoying a sunny afternoon is a great highlight of summer in the city. If you are a sports fan you will love Toronto in the summer. Toronto has two open top stadiums that house 3 different sports teams for the summer months. In the city’s Liberty village area you will find BMO Field which is home to the Toronto FC Soccer team and the Toronto Argonauts Football team. This newly renovated space is a perfect place to take in a match and soak up some summer sun. Right in the downtown core of the city beneath the CN tower lays the Roger Centre. This massive dome has a one of a kind retractable roof that opens for Toronto Blue Jay baseball games when the weather is favourable. There is nothing quite like watching a game on a sunny afternoon with the CN Tower and Toronto skyline looming above you. Known as the Exhibition, The CNE or simply the Ex, the 3 week festival is a must see if you’re in the city in August. Millions of visitors, yes that’s right Millions of people visit the CNE every year to be entertained, play and indulge in an dizzying array of carnival style food.The CNE is a Toronto essential and has been running for nearly 140 years and should be on your list of places to check out when in town. If you are travelling with children there are some world-class attractions that you will definitely want to check out. The first is the Toronto Zoo, which despite its name is actually in Scarborough. While the Zoo is open nearly year round, the summer is arguably the best time to take a stroll around its sprawling grounds. Centre Island is another great place to take kids while in the city during the summer. This island is a part of the Toronto Island region located just a short ferry ride from downtown. Explore the waterside trails or visit the Centreville theme park that is created with children in mind. Summer is also a great time to visit Toronto’s largest public park, High Park. This space features many hiking trails, sports facilities, diverse vegetation, a beautiful lakefront, convenient parking, easy public transit access, a dog park, a zoo, playgrounds for children, a couple of eateries, greenhouses, picnic areas. 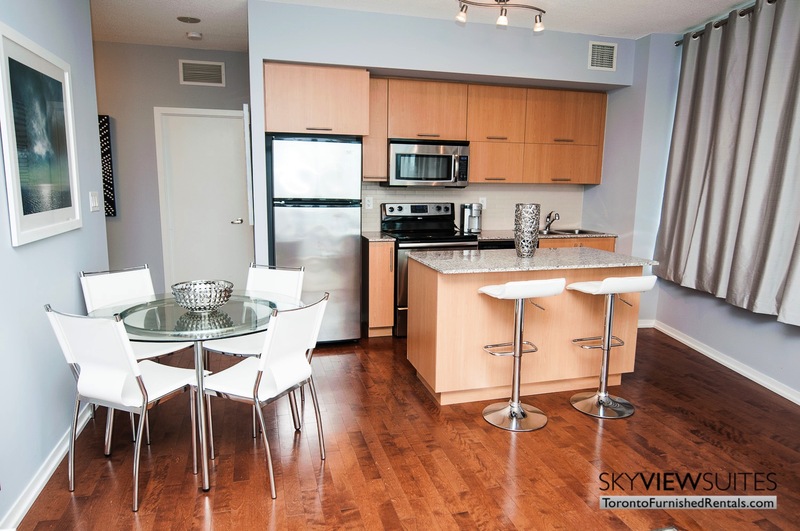 You can easily access all of the attractions listed above by staying in on of our furnished apartments this summer. The summer won’t last forever so get out and enjoy the Toronto sun while you can!